Why is this a good plan for our district now? The School Board believes that now is a good time to add classroom space at Rossman and Lincoln Elementary Schools. Hartford Jt. #1 School District taxes have dropped for the past eight consecutive years, while enrollment is trending up. Due to our conservative approach to spending, we have the ability to add this referendum funding without increasing taxes. Enrollment in our District has grown for 1,508 in the 2002-03 school year to 2,012 today. This growth represents an average increase of approximately 31 students each year. We anticipate enrollment, with minor adjustments, to continue this slow and steady upward trend because of residential and business growth in the area. Adding classrooms at the elementary schools will help us build capacity for future enrollment increases at Hartford Jt. #1 School District. Hartford schools are great places for students to reach their highest academic potential! Both Lincoln and Rossman Elementary Schools received "Significantly Exceeds Expectations" ratings on the state report cards. What is the tax impact of the referendum? There will be no impact on current school tax rates over the life of the 15-year borrowing term. 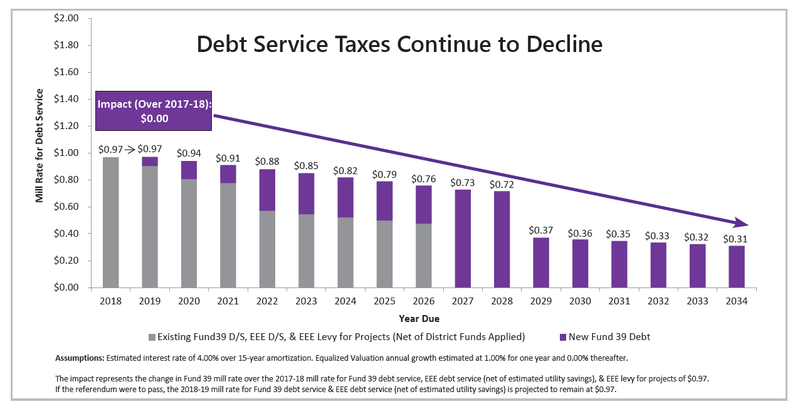 This is because the District previously paid off building debt early. Given the District's history of fiscal responsibility and the current low interest-rate environment, the Board of Education believes this is a good time to move forward with this proposed referendum.